Noting the ‘infamy’ surrounding early Sutcliffe Jugend output, rather than continuing with over the top harshness and aggression, the project has instead pushed into more diverse experimental realms. ‘Amuse Boche’ is an example of this approach being an industrial soundscape of tribal-esque rhythmic structures, layered noise and vocals ranging from spoken to shrieked. As I have not really kept up with current output I am not sure if this track is representative of current era Sutcliffe Jugend, but regardless of this it is a pleasing track. Alfarmania are up next and deliver a track of slow stalking paranoia, containing their trademark elements of distant cavernous clatter, wavering atonal synths, buzzing static, plodding bass and ragged agonized vocals, but also featuring a prominent Swedish dialogue sample. With a 12 minute span, the track takes its time to unfurl whilst upping the tension as it proceeds, but is also quite a bit more atmospheric than other more oppressive material from the project. Excellent. Last Dominion Lost offer up the piece ‘To the Master a Long Good Night’, which evokes a twilight ritual industrial soundscape based on stilted percussion, sporadic gongs, scattered electronics debris and garbled spoken voices, (…and with its titled I believe is paying homage to the late John Murphy). Although I am well aware that Nikolas Schreck has a long standing legacy associated with his band Radio Werewolf, they are not to my liking as I have personally never been a fan of material with a goth / rock slant. In solo guise Nikolas Schreck retains quite a flamboyant gothic undertone, where on this track ‘Lord Sutekh’s Dream’, he delivers an earnest song of prominent crooning male vocals and minimalist synth, atmospheric tabla and martial percussive backing. However like Radio Werewolf, the gothic frame of reference means this is simply not a style I am fond of, so there is not much more to say other than this a track for skipping during my repeated listens of this comp (…different styles for different tastes really). Budras follow and shifts the sound back to more pleasing sonic territories. Noting the quite unique sound of the group (which is largely down to the agonized gruff vocals), here the track features a blend of rather unusual, droning atmospheres, industrial soundscapes and their now trademark vocal presentation. Gerechtigkeits Liga follow and after a short rather throw-away ‘casio keyboard intro’, the track leaps headlong into an excellent ‘post mortem’ style composition. With a murky, lo-fi and blown out sound, there is a sense of a basic looped structure, but heavily layers to achieve complexity. An excellent offering. Skin Area then have the distinction of rounding out the CD, with a strong 10 minute track, here featuring a long form muted industrial noise soundscape. With a muffled and distant tone, the piece builds with rising static and forceful drones, as Martin Bladh’s strained vocals echo forth from the far background. Building to a mid-track crescendo, the pieces then falls back to calmer and sonically open territory for the remainder of the track. As with earlier editions, the cover is beautifully presented as a colour multi-page page booklet, including a selection of lyrics, text and art from contributing projects and which complements the musical content perfectly. 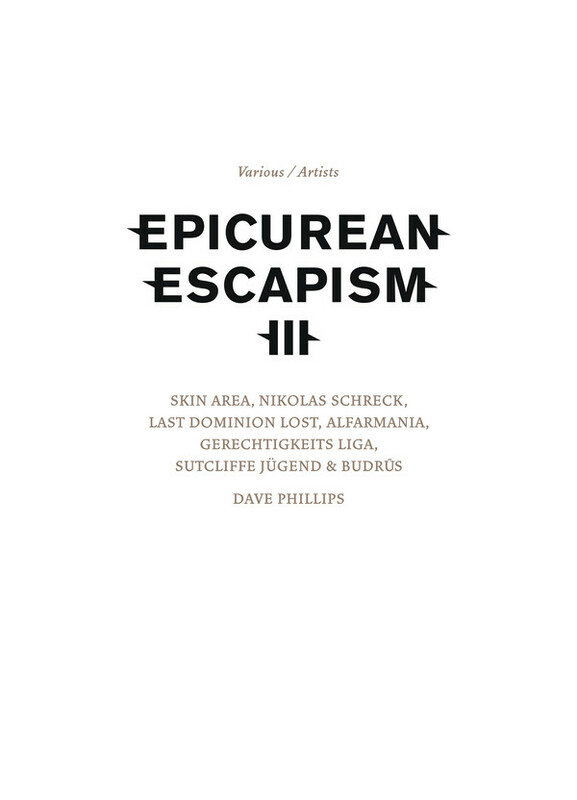 A notable inclusion is an essay by Uwe Schneider on the conceptual underpinnings of Dave Phillip’s work, which ties in with his performance and screening of video works at the 20016 Epicurean Escapism Festival. Although Dave Phillips is not featured on the musical compilation, he is dedicated his own stand-alone DVD with the banner title of ‘Proceed With Inquiry’, which features specific video works, footage of prior live performances and another series of video art collaborations. While there is a huge wealth of material to go through, a single video stands out as the critical centerpiece, while the rest can be considered as additional complimentary material. This main work in (entitled simply ‘Video Action’) is a 20 minute video work which ties seamlessly with the accompanying experimental industrial soundwork. Musically the piece is framed around sharp sonic editing of micro-tonal textures, overblown distortion, atonal piano chords, multiple higher pitched sounds pushed to disharmonic orchestral intensity and treated ‘voices’ (both human and animal). The piece has a strong and focused concept, where text and images which are edited with razor sharpness to outline a grim analysis of man’s development and technological advancement and the impact it has had on our humanity and our treatment of animals and the environment, and the broader sentiment of mankind being out of balance with a sustainable use of the earth’s resources. A large part of the visual material focuses on the industrial nature of our society, coupled with the mistreatment of animals in the mechanized meat production industry and a consequence of such technological development. To highlight just a few of the statements which personally resonated with me, these included: “The despair of our culture and civilization should be defeated by acts of total honesty”; “Cynicism is a popular defense mechanism”; and “Our technology has exceeded our humanity” (which of interest clearly implicates everyone with the use of the word ‘our’). But for its unflinching gaze and the brutality of aspects of the subject matter, this seems to be used with clear intent to shock the viewer out of complacency and to highlight a central message of respect for ALL animal life. The video also functions as a broader call to arms, but also does not offering any simple or easy solutions, other than to take personal responsibility for the consequences of one’s own choices and the wider implications those choices have. To then make sure the message of ‘Video Action’ is not lost, the DVD is armed with subtitles in 9 different languages. With a general observation that there is a lot of thematically derivative material circulating within the underground, Dave Phillips’ work is refreshing in its directness, solid conceptual framing and and immediacy of its impact. As with earlier editions in the Epicurean Escapism series, this is another fantastically realized musical and visual set that can either constitute an excellent ‘stand-alone’ document, or a memento the 2016 Epicurean Escapism Festival event. This entry was posted in 2016, dark ambient, death industrial, experimental, power electronics, ritual, The Epicuriean by noisereceptor. Bookmark the permalink.